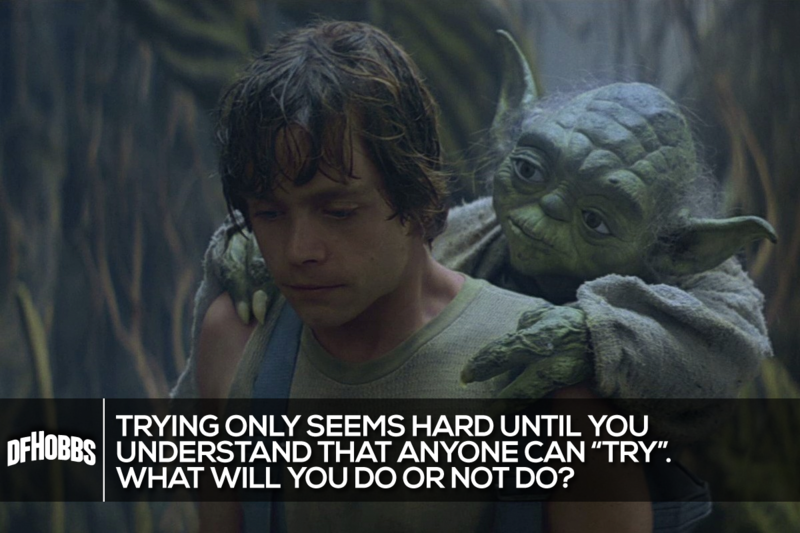 Yoda was a tough taskmaster, but there is an important concept inside those words. "DO OR DO NOT; THERE IS NO TRY". And I'd like to think it is apparent in the way I approach life and in much of the work I've produced over the years. It is "done." That is, good, bad, or mediocre – I put it out there. (Whether you or others comment or not is less important than that I review it myself.) Not that dabbling in new experiences isn't important. It is. However you'll learn more from doing the thing you're contemplating doing than you'll learn by continuing to contemplate it. Wouldn't you know it, I found some creators that think along similar lines. This manifesto is a collaboration of Bre Pettis and Kio Stark found around the net but I bring it to you from the Bre Pettis Blog. (An interesting side story is that they completed this manifesto in 20 minutes, because that was how much time they had.) Read through it and contemplate how much more you'll accomplish in your life if you stop trying and "just do it."